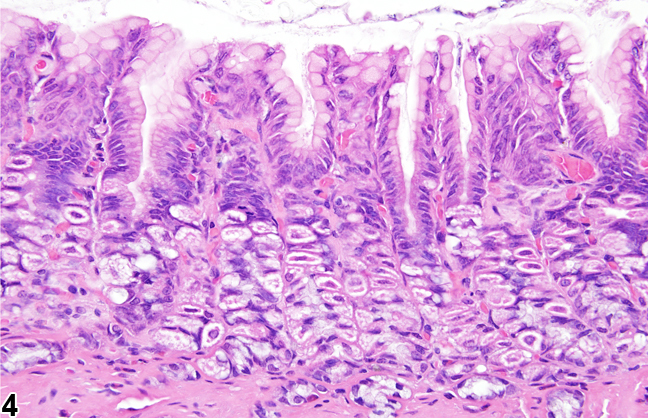 Normal glandular stomach in a male F344/N rat from a subchronic study. 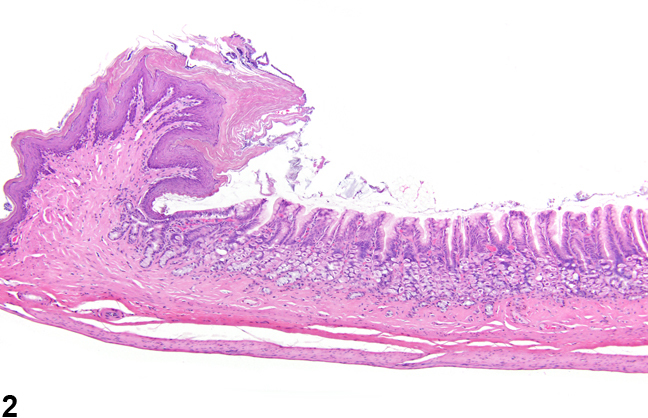 Stomach, Glandular stomach - Atrophy in a female F344/N rat from a chronic study. There is thinning of the glandular mucosa near the limiting ridge. Stomach, Glandular stomach - Atrophy in a female F344/N rat from a chronic study (higher magnification of Figure 2). 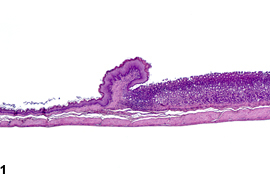 The thinning of the glandular mucosa is due to loss of glandular epithelial cells. Lesions of the glandular stomach are rare in NTP mice. 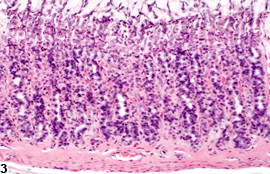 Focal mucosal atrophy characterized by decreased size and number of mucosal epithelial cells may result from ulceration, inflammation, mineralization, or infarction. Generalized mucosal atrophy can be chemically induced as in Figure 2 and Figure 4 . Diffuse atrophy can also be an age-related change with a diffuse decrease of mucosal height and increased mucosal fibrous connective tissue. In the aged rat, fundic glands may be diffusely atrophic, with fewer parietal and chief cells, and contain cysts. 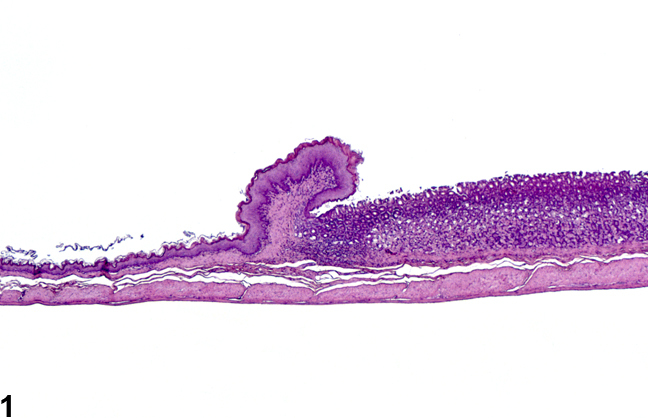 Glands are replaced by fibrous connective tissue with focal lymphocytic infiltrates in the lamina propria and the glandular epithelium and a mixed inflammatory infiltrate along the limiting ridge. Atrophy should be diagnosed and graded. 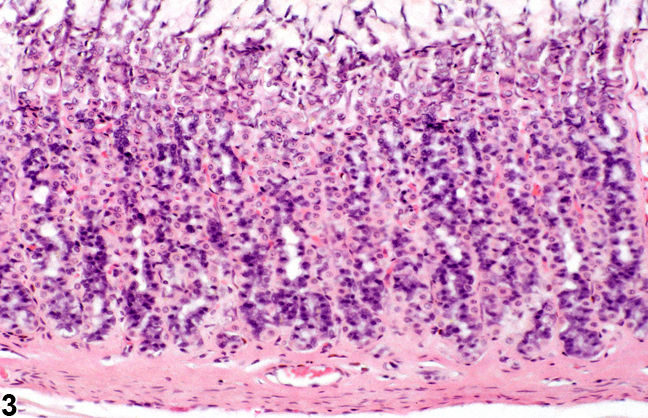 Severity grade depends on the extent of the lesion and degree of loss/decreased size of epithelial cells. Abdo KM, Cunningham ML, Snell ML, Herbert RA, Travlos GS, Eldridge SR, Bucher JR. 2001. 14-Week toxicity and cell proliferation of methyleugenol administered by gavage to F344 rats and B6C3F1 mice. Food Chem Toxicol 39:303-316. Dethloff LA, Robertson DG, Tierney BM, Breider MA, Bestervelt LL. 1997. Gastric gland degeneration induced in monkeys by the CCK-B/gastrin receptor antagonist CI-988. Toxicol Pathol 25:441-448. Eissele R, Patberg H, Koop H, Krack W, Lorenz W, McKnight AT, Arnold R. 1992. Effect of gastrin receptor blockade on endocrine cells in rats during achlorhydria. Gastroenterology 103:1596-1601.